By 1766, the Corsican flag (double black-on-white blindfolded moors) became familiar in all harbors along the coast of the Mediterranean. The scheming (Malfia-like) Genoaese had lost control of the Island. Leading the Genoa/Serene Republic, Sorba petitioned France to extend their troop-support residence beyond their agreed-upon withdrawal date (to end in 1768). He knew that the Republic could not hold onto the Island. Paoli’s solution was that Genoa accept Corsican Independence, and the Liberated nation of Corsica would compensate the Genoaese for the ports they vacated. The Serene Republic was too vain and proud to accept that humiliation; and they instead decided to carry on their intrigues with the French Court, and try again to bribe and buy the loyalty of the islanders…and if all those measures failed, they continued to stir-up discontent, bigotry and revive the vendetta on the Isle! "Friends, we do not come here as conquerors. We are your brothers and you know this. Why then have we come? We are free, but you are still under the yoke of our common enemy. We come to share our liberty with you. Our cause is the same. Embrace us; march with us." Caprajans threw down their arms and rushed to embrace the Corsicans. When at daybreak, the Genoaese commander, Baron Oltre, saw the flying Corsican Flag, he at once proclaimed that Macinaggio would be razed to the ground….Instead, the Genoaese ended-up having to flee. A felucca brought back the good news to Paoli in Centuri…. The pride of the Genoese was exacerbated. They would assemble the largest armada ever in their history! And, meanwhile, French Marshall Choiseul decided to do his part in settling the matter. Matteo Buttafuccio, traitor and colonel of the French-Royal-Corse, was sent to Paoli. He treacherously (knowing that it was highly not the case) offered Corsica her independence IF THE GENOESE SUZERAINTY WAS FORMALLY RECOGNIZED AND THE GENOESE WERE ALLOWED CONTROL OF THE SEAPORTS! Choiseul was well aware that "The Treaty of Compiègne" had only a year left to run. If the French would then retire as agreed, the Corsicans would certainly be liberated masters of their own Isle. The 05th of May 1767 brought the Genoaese Armada again to the coast of Capraja; and among them was Antonuccio Mantra and all his "Casa Nostra" mob-followers…Some of these knew the Island well….But, patriotism ran really high amongst the Corsicans, and many loyal Corsicans had sought refuge in Genoa…and were part of the conscripted seaman aboard the Armada. Some of these men were left in Civita; and while they were being mustered to man the Genoaese ships, that a mutiny broke-out: The exiles suddenly decided that they would no longer fight against their brothers. One of the most respected officers in the Genoaese Service, Major Quenzi, resigned his commission rather then lead men against his countrymen. It was not only the Serene Republic that was threatened, but also France on account-of the Commerce situation. Capraja lay athwart the Genoaese sealanes to the Lavant….If the Tuscan Seaway was denied to Genoaese and French shipping, the ships would have to go around Corsica itself! This startled the French into scheming a way around their soon-to-run-out Treaty! The French knew that Genoaese rûle was a fiction; and that only their French troops in Corsica stood in the way of Corsican full Independence. The reports that Chauvelin received from Dumouriez convinced him and the French government that French troops could indeed overthrow Paoli. The French sought to annex Corsica. (This was already widely believed since 1735, as Campredon’s position.) It was to stop the progress of Britain in the Mediterranean, who already held Gilgraltar and Minorca. [AND JUST SEE WHAT THEY DID TO THOSE ISLANDS!!] France already lost Canada to the British in the "Seven Years French & Indian War" and Choiseul, the French Minister of Foreign Affairs, knew it meant high recognition for him if he could so regain French Pride in harnessing Corsica. Unfortunately, Pasquale Paoli did not know the manner in which Choiseul`s mind was working! Paoli knew that Corsica was admired throughout all Europe and America. He also knew that his principles put into action on the Isle of Beauty won him even the respect of many Frenchmen. Choiseul informed Paoli that if the Corsicans would permit Genoaese suzerainty over some coastal ports, Genoa would recognize Corsican Independence. Paoli may have been trusting; but he certainly was no fool: on 03 June, Paoli rejected the offer. Choiseul subsequently proposed that Genoa should maintain garrisons in Bastia, San Fiorenzo and capo Corso….Obviously Paoli rejected this as well. Going on at the same time of these "negotiations", was the Jesuit expulsion from Spain. The Pope was unwilling to see all the Jesuit Fathers wandering homeless in Europe. So, he proposed to the Genoaese Senate, if they could be permitted to set-up home in Corsica. France, though, who already had expelled the Jesuits, was angered that the Genoaese was so quickly to offer them succor!…As a mark of displeasure, on the day that the Jesuit Fathers landed in Ajaccio, the French retired from the town…as a gesture, surrendering the fort to a Genoaese garrison before they officially left. Immediately, Ajaccio was overrun and occupied by Paolists; and besieged the fortress. The Genoaese, in desperate straights, summoned MARBEUF who in-turn requested Paoli lift the siege. Paoli did this, innocently and willing as ever to prove his respect for the French. But still, the Jesuit Affair led to bitter enemity between the French and Genoaese Courts. The Genoaese knew though, that without the French protecting the Corsican ports for them, they would elsewise have to accept any terms Paoli pressed forth on them. The disastrous defense of Capraja cost them, 3,000.000 lires. G.B. Brignole of the Genoaese Senate planned for the Genoaese leave of the Island by accommodating the French, if only the French declined to formally relinquish recognition of Genoa’s authority and suzerainty over the Isle. The seaports that were leased to France in 1764, the French would continue to exercise autonomy, as well as other locations on the Island which the French deemed necessary for the safety of French troops. The French possession of the Isle was to be security for the repayment of expenses incurred by the French during the occupation. This "Treaty of Genoa" proposed that at any time, the Genoese could reassert her rights to turn the French out IF THEY COULD PAY THE COST TO DATE OF THE LEASED OCCUPATION. For ten years, France was to pay the Serene Republic 200,000 livres a year for the advantages of governing-occupation of the Isle. In the bargain, the French were to free from Corsica, the island of Capraja and return Capraja to Genoa. In effect, the Genoaese just ceded the Isle of Corsica over to France! Sorba sought that this treaty was effected. But, everyone was skeptical of the sincerity of the French…knowing their full interests in the matter; as well as their desire to have complete autonomy over Corsica. On 15 May 1768, Sorba and Choiseul negotiated and signed the GenoaeseTreaty! This was power politics as naked and unashamed as any power-politics could possibly be! All this was done without any approval by the Corsican people. Marbeuf IMMEDIATELY requested that Paoli totally leave the town of Ajaccio. Paoli did not know the complete scheming going on. He relied on the good relations which existed between his government under the old Treaty of 1764. Paoli knew nothing of the closing provisions of the new treaty. Paoli therefore, asked point-blank for an explanation of the request to leave Ajaccio! Marbeuf lied to him brazenly: He told Paoli that the evacuation was requested so that the Treaty of 1764 could be terminated without any legal squabbles with the Genoese…and [deceivingly and out-right lying] said that this in no way affected the original Treaty or the determination of the French NOT TO ALTER THE STATUS OF THE ISLAND! Paoli may have been doubtful; but he had no cause to distrust the French as the end of their occupation under the Genoaese was so near; AND HE DARED NOT DO ANYTHING THAT MIGHT BE CONSTRUED AS HARMFUL TO THE "DE FACTO" RELATIONS WHICH EXISTED AS OF YET WITH THE FRENCH and his (Paoli’s) government. On the19th of may, Paoli withdrew his forces from Ajaccio. But, the threat was evident and soon clear. So, Paoli convened a Consulta at Corte on 22 May 1767. On the 22nd, as the representatives were gathering for the Consulta, news was brought of the tons of French transports arriving at the harbor of Ajaccio loaded down with French troops and artillery. The assembly was unnaturally quiet when Paoli entered. Paoli detailed what he knew of the negotiations of the past months. The French had assured me, that if we suspended our operations against the ports that they had occupied, that they would retire at the end of the four-years’ agreement and we Corsicans would be free to assert our rights. I sacrificed all the manifold advantages we had because I honored the French King’s intentions toward us." Paoli told the assembled Consulta, that the Corsican people throughout the four year term of the French occupation was willing to negotiate and be part of a good agreement between Genoa and the Corsican peoples….accepting the French mediation was sure proof of this. But the Corsican people always insisted that any agreement had to guarantee Corsica her independence and unity of all nine provinces of the Isle. When it became quite clear that the Genoaese would not come to any agreement of this kind alone, the Corsicans were expected to believe that the introduction of French forces would be for peace-keeping purposes only; and the French would accordingly retire from the Isle once the four years ended, and thus the inhabitants of this fair Isle would be free to settle their own differences with the Serene Republic. "We had regarded the rumors which reached the Isle of some sort-of dubious provisional cession of Corsica, by the Genoaese to the French, as baseless and indeed incredible, YET, the French have just disembarked troops…and other arrivals of French troops are now expected. We are completely ignorant of the motives behind this landing and of the end for which the expedition is intended. But, naturally enough, this event alarms the whole nation. You have gathered here for purpose of considering the French action and of adopting the measures that you judge will be the most efficacious in the PRESERVATION OF OUR LIBERTY AND INDEPENDENCE. I have no doubt the measures that you undertake today will be worthy of the people who have chosen you for their representatives." Paoli immediately wrote to the French government concerning the enormous attachment of French troops to the isle. "If foreigners land on our shores to sustain the pretensions of their allies, we will face them!…may our resolution never fail and may our enemies, whatever may be their name, learn by experience that the conquest of Corsica is not an easy task. There are in this country free men and free men know how to die!" The old Genoaese art of bribery and corruption tried to peek open again with a vengeance, this time through Marbeuf and the French!…while always deceivingly claiming neutrality and friendship toward Paoli’s government. This was obvious deceit, as the true intentions of the French was known, even if to only a few of the French officers serving in Corsica. General Paoli was indeed uneasy, but prepared to hold his forces in check until the truce between the French and Corsican people expired on 07 August. Until the French actually attacked, he had estimated that a free Corsica and her people could still be a reasonable expectation. Unexpectedly, at this very moment, Paoli’s government was awarded full diplomatic recognition by Tunisia! (Some months back, a Tunisian ship ran aground near Balagna’s coast. When Paoli heard of it, he gave immediate instructions that the Tunisian sailors were to be succored and all Tunisian goods returned to them. Paoli’s order was obviously obeyed; for the Balagna people counted Paoli’s word as divine. Paoli then offered to repair the ship and provisioned with a new set of sails along with many gifts for the Bey of Tunis. The Bey of Tunis was astounded that Christians would act so toward them; and he repaid the Corsicans and Paoli in kind. "The Bey salutes you and wishes you well", one of his secretaries announced as they landed at Isola Rossa in July. Paoli at Corte shook his hand, and catching him at his arm, conducted the ambassador to the Palace. There followed a series of talks and gift-giving. Paoli was given an Arabian horse, two ostriches, a tiger, pistol-pair, and a diamond sword. Fun and games were short experiences…. The Soubise regiment of Calvary disembarked at San Fiorenzo, and demanded to be permitted to procede to Bastia. Paoli, still suspicious (but diplomatic as ever) agreed PROVIDED THAT THE THE REGIMENT PROCEED ONLY WITH UNLOADED WEAPONS. Agreeing, the French continued onto Bastia unmolested. STILL, in reality, the French had already decided upon war: all they needed now was a pretext/ an excuse. Finally, Marbeuf informed Paoli that the Marquis de Chauvelin was on his way to the Island ready to fully explain the intentions of the Duc de Choiseul. Paoli MUST, along with the village of Isola Rossa admit all the coming French troops! This demand, obviously, was designed to break the truce and provoke a breach. Paoli surely felt that the time for diplomacy was at an end. A clear Corsican stand had to be made…But before he had even time to reply to Marbeuf, the FRENCH LAUNCHED THEIR FIRST ATTACK! Such was the act of French cynical "chagrin" complete, especially now that they were in a strong, fortified position on the island. Marbeuf’s extremely heavy attack overwhelmed the Corsican forces. The unexpectedness of the attack, the perfidy of "good-will", the so-many "professions of friendship". The keys to Capo Corso were lost to the French.. Before long, the French occupied all the peninsula coast. Corsican men were either killed or captured. The French attacked the defenders even on the east coast. Casella had sent the remainder of his garrison to the aid of Barbaggi’s Tower. The next day, the sentinels in the tower saw the approaching French troops. A feeling of defeat was finally coming over the Corsican people. But Casella feigned-on; fooling the French that he had a batallion of men with him. A white-flag came toward him at the fortress-tower, asking him terms for surrender….Casella demanded that his garrison should march out with full honors of war, and furnish horses to draw away the cannon. Grand French-General Maison consented. Accordingly, with the Documents of capitulation exchanged, French granadiers lined-up at the foot of the tower to render the honors due to the surrendering "garrison". The door opened, and out-marched Casella. The French commander inquired of the old-man, "Where is the rest of your garrison? "….Casella proudly exclaimed "I am the garrison"! The terms for the capitulation were accurately observed…. The deliberate "chagrin" of the French roused the Islanders to a fury. Once again, the clergy were preaching a Holy War in the glens..Clemente Paoli managed to repulse the French forces of the Marquis de Chauvelin (who had managed to sail back to Corsica from the ports of Provence with an official French commision)! But the marquis brought some 9,000 additional troops making a total under his command of 13,000. The arrival of Chavelin spelt an end to Corsican libertarian hopes. The English government, led by the Chathamites, under their Prime Minister Grafton, was completely opposed to any Corsican aid. Weymouth and the Bedford Whigs were unanimous. This was the main decision rendering in Choiseul thinking. Since England would not go to war over Corsica, he was free to press forward with his attack upon Corsica. But the sudden "dénouement" was unexpected by Paoli. Upon the arrival to Corsica of Chauvelin, Paoli announced, "While Rome deliberates, Saguntuum is lost." "Already our nation has shown how little claim the Genoaese had to our island. All the powers of Europe, especially France, have recognized us in practice AS A FREE AND INDEPENDENT PEOPLE. So France has treated us, until the last few years. Even if Genoa had possessed the sovereignty she falsely claimed, would she now be able to transfer it to another nation WITHOUT THE CONSENT OF THOSE SHE PROFESSED TO GOVERN? SHE HAS NO RIGHT TO DO SO, FOR THE BASIS OF SOVEREIGNTY IS THE PEOPLE." Paoli issued a call to all the Corsican Islanders to keep the ranks they had closed against the Invaders. The French again had taken over the old-malfia Genoaese tactic, assuring the Islanders that the King of France was going to make Corsica a model French state! And that Paoli was leading them astray. Falsely he Chauvelim said he would pardon the chiefs who deserted General Paoli and submitted to the King! The Chiefs would be paid handsomely for their submission…. "Let each take-up his appointed position. We will show them that we are not to be treated like a flock of old sheep bought in a market-place; for, that is what they are trying to do. Always, there have been strangers between ourselves and the Genoaese, preventing us from a decision by negotiating or by the force of our arms, and always, as a result, Justice and Honor have been trampled in the mud. Now we are face to face with our last enemy. Citizens, I know the danger is great but I know too, we are not accustomed to count the number of our foes." Corsicans could not be divided and intended to fight. Chauvelin quickly came to this realization and launched a full scale attack to crush the Corsicans. The French brought with them all the necessary weapons for an unpresidented attack, hailing a shell of bombs and bullets, Furiani was taken. The town was reduced to ruins. Houses were set afire.. But the French were less successful in their attempts to storm the passes of the Nebbio; still, effectively pinned-down, Clemente Paoli’s forces could make no progress. The French advanced to the bridge across the Golo. * Chauvelin used french warships and transports to effect a landing in the rear of the defenders of the Golo. The French commander, Arcambal landed and attacked with all their force the bridge of the Golo. Corsicans, who in the last stage of the Great Battle, fought from behind a rampart of their dead. The traitor, Buttafucio occupied his native village of Vescovato. The Junta of the Casinca, established at the Convent of San Antonio della Casabianca (where Paoli’s Gereralship was inaugerated), counter-attacked. It became a rallying place. Clemente Paoli rode rapidly from Nebbio’s mountains to take command of the forces at Casinca. But the French were everywhere. Emmisaries of Bottafucio, came down proclaiming the Corsican cause to be lost; so please surrender! Clemente Paoli, this warrior-monk to be, turned these village traitors over to the Fathers of the Commune for trial and punishment; and then launched a furious attack on Vescovato. The French viciously burned the olive and chesnut groves in the area; but they were overwhelmed by the onrush of Clemente’s militia. Vescovato fell, the French army split…retreating to Penta. Heavy losses or not, Clemente Paoli wasted no time, and pushed-on with his detachments, storming Penta. As soon as it was reported to him of his brother’s successes, Pasquale Paoli gave orders to all his Commanders on every front to make an all-out attack on the French positions…. The French were highly unused-to such furious and impetuous attacks and were successfully driven from Vignale, after suffering heavy losses, leaving their munitions and provisions for a whole division, in the hands of the Corsicans. Colle pursued the French across the "macchia" of Nebbio. The French arrived at Lagobenetto, finding the bridge occupied by the patriots…. Gen. Arcambal ordered his troops to swim or ford across the river. Of the 2000 French, only 500 made the far-bank. In Borgo, the French believed that they were safe….On the night of 07 October, Paoli issued orders to all his commanders in the east to gather under the walls of Borgo. He held a council of War with them; at which unanimously they decided to attack the village. On the evening of 09 October the assent to capture Borgo began. The French had 4000 infantry, 300 Calvary, nine pieces of artillery, and were commanded by the Marquis de Chauvelin. Added to that were the 1500 men of Gen. Maison who had attempted to advance to the mountains of Oletta…. At mid-day, Nabonne-Fritzlar (commanding the German genadiers of the Saxony & Rovergue Regiments) ORDERED A SUICIDAL bayonet-charge. The Corsicans held firm and the French finally retreated. Colonel de Ludre suffered the humiliation of seeing the Corsical national-flag flying from the ramparts of the town. "Against their own best interests the French today make war against a people which had always delighted to be on good terms with them. And now they complain that I am seeking assistance from a foreign power, as if that were a crime! Indeed, if I were the master of thunder I would use it for the defense of the liberty and independence of my country. On the other hand, I would not, however, refuse any proposal from the King of France, which might spare us our National identity. We would really respond to any overtures of that nature, but if they do not come, I know where my duty lies and be assured I will do it." If England attempted to give Corsica even a shadow of support…such would, he hoped, persuade France to recognise the danger of having another enemy in the Mediterranean. The British government dissolved in November 1768, but even with the new Parliament, a "Corsican" motion was defeated 230 votes to 84. They had more things to worry about, particularly in the Americas. French money seems to be accomplishing what French arms could not. Chauvelin’s agents in Capraja bought Astolfi, and Astolfi surrendered Capraja without even one shot. But at Leghorn, Angelo di Franceschi would not assent to the King. He answered that he already owed allegiance to a Queen [Mary] who favored her subjects with Liberty.. Yet Paoli would not punish the families of those who gave their allegiance to France. Paoli stated that he would not sacrifice the many innocent for the sake of the few guilty. "We do not believe that he can be deceived or that he will ever deceive us." And, the islanders were willing to follow Paoli wherever he led them. But Paoli was no vain dreamer: He understood that fighting a guerrilla war would not only hurt the trust of honor shown him by the world; but that with the passage of a short time, France would remain strong, and Corsica gradually would become weaker and weaker, without a male patrimony to sustain her as a nation. So, Paoli wrote to the Duc de Choieul, his enemy, and outlined a plan which he presumed would satisfy both France and his nation…. Paoli proposed that royal Authority would be recognized by Corsicans; but that the Corsican people would have (and perpetually retain) their own right to manage her own affairs internally, and continue to make he own laws, as per sé the Constitution that was already operative. France should protect Corsica from any further aggression or attacks; and Corsica would supply France with troops if France became militarily involved with any other power…an equal number of Corsicans would serve France in any possession she might stipulate on the continent or the Americas. There was agitated discussion at the French court; for it was widely believed that the King was thinking about accepting Paoli’s proposal. But Choiseul would not make any attempt in replying to Paoli. It offended his "pride" too much. Besides, Choiseul now saw what his money could buy; and he was ready to make more purchases..
At the Port of Isola Rossa, two Englishmen, Fawkener and Menzies awaited him. They had ascribed for the Corsican patriots 8,000 British Pounds Sterling. They regretted that the legacy was so small. It was bestowed by an old man who said "he left his little fortune to Liberty and its struggle with Royal despotism on the island of Corsica." He gave it "to that liberty, for which heroes shed their blood and sacrifice their lives." Then there were two emissaries from France who wished to see Paoli as well.They were the priests, Guasco and Morazzini. Paoli met them in the company of Falkener and Menzies at the Convent of Santa Reparata on the 13th of November 1768. They conveyed Chauvelin’s hope for a winter "reprisal" or temporary "armistice". Paoli sent them back, telling them that "it was a matter of indifference to us whether we die in one season, or another." Chauvelin took the news just as he suspected. He knew that his new well-laid plot was about to be hatched. : Guido Peraldi and Fillipo Banconi, making contact with Abbé Fabbiani, seduced the weak abbot by promise of ecclesiastical promotion! Fabbiani was thus able to subvert his nephew who was an officer at Isula Rossa. But, when confronted by the suggestion, Fabbiani’s nephew (totally devoted to Paoli) outright refused partaking in the scheme. Then Dumouriz played another "plan": The Abbé contacted Comte de Perez (captain of Paoli’s naval Fleet) whose flagship presently lay in the Bay of Isola Rossa.. Accepting the bribe, Perez was to persuade his crew consisting of the Paoli loyal Knights of Malta, which were protecting [for Paoli] the Corsican coasts. Most of these Maltese refused, so, boat-loads of French at night boarded the vessel and ousted the Maltese and Paoli’s dedicated followers. Perez then hoisted a lantern aloft as a signal to the French warship cruising just off-shore, "La Provence", which rapidly then landed their French troops just outside Isola Rossa,sailing into the harbor, opening fire on the citadel. Paoli’s guard was out-numbered, BUT from the surrounding houses came Paoli’s followers. So Dumourez and Perez scuttled swiftly back to their boats…BUT the traitor Abbé Fabbiani drowned as his bateau overturned! Perez hardly landed his treacherous crew at Ajaccio when again he was proposing another scheme to the Comte de Narbonne (who was commanding the French troops on the western end of the Isle…. He proposed enlisting the Oltremonti Greek decendents on the Isle (which had been transported by the Genoese to Ajaccio from the Peloponnesos in 1676); whom he thought were outcasts to Paoli’s people, as they were not "Roman" Catholics. He would supply them with weapons! I should point out that the Greek Church at Cargese is not Greek Orthodox, but a Catholic Church of the Byzantine rite. That’s how they are allowed to have a single priest serving both churches; the Vatican would never allow one of its priests to conduct a Greek Orthodox mass. When the Greeeks came to Corsica (to escape the Ottomans) at the invitation of the Genoese Government, it was made a condition of entry that they should abandon Greek Orthodoxy (with its different date for Easter, Patriach of Constantinople etc) and embrace the Roman Catholic Faith. They were however allowed to continue to celebrate their masses in the Greek language. There have been more than a few hints over the years that some of the community have leaned in the direction of Orthodoxy despite their ancestors’ assurances, but now, sadly, the community does not even speak Greek as its first language any more. Cargese’s last Greek speaker died in the 1970s. Abbatucci was laying ill, but he dragged himself out-of-bed to lead the Ajaccienne faithful to victory…Again driving back Perez! Perez took ship, as quickly as possible, for France…. Next, the French tried bribing young Matteo Massesi. He would be given a high position in the new French Government to be set-up in Corsica! Oddly enough, the letter to Matteo fell out of his pocket, was intercepted; and Paoli’s followers sent Matteo to Corte to be tried. The young man, ashamedly confessed..along with the Viceroy. Then there arrived ten new batallions of Infantry from France, as well as two squadrons of Calvary. Chauvelin planned a concerted attack, and the Corsicans were raised to a new degree of boldness and commitment. Within a week, they had swept the French out-of almost all the of Murato. They stormed and took back their village of Barbaggio. Chauvelin finally reached the conclusion that Corsica was not worth the expense of men and monies necessary to achieve a conquest…resulting in Chauvelin being recalled to France on 28th December 1768. The Comte de Marbeuf was promoted to Lieutenant General. Oletta held a garrison of some 1500 French troops, quartered mainly at its great Church which the French turned into barracks! Grand-Maison governed the village by a deliberate system of terror and repression. Any Corsican found, without a French issued pass or not back a an appointed time, would find his entire family imprisoned or worse. All Corsicans were totally disarmed, were not permitted to hunt. Any violation would mean instant execution without trial for the perpetrator and his family….Grand-maison had ordered martial law; summery executions were publicly made…and a church-plot to blow-up the Church in Oletta was foiled. Two of Paoli sea-captains, Paciola di Calvi and Lazaro Costa cost the French 2,000,000 francs. By the December’s end of 1769, they successfully captured two French warships which were bringing aas a relief to the French forces in Corsica, 3000 muskets, 340 barrels of gun -powder and 160,000 of francs worth of uniforms, Abbatucci with his fighting force of priests Guagno and Guilio Foata occupied the Jesuit Convent in Ajaccio. But the traitors in Olmeta enables the French to regain possesion totally of the town; and then later retook the Jesuit Convent in Ajaccio as well. The French already had thirty batallions of Infantry on the island. That was increased to 45! Three regiments of french Calvary were already at Bastia, and they were also brought-up in strength…by adding a fourth! Obviously the Mantra clan volunteered to add their weight ot deriding the Paolist government. These evil men were calles the "corps of Vttoli" after the Sampieo murders in 1765. Corsicans would defend their native soil to the very end; but Paoli was concerned about the utter destruction of his beautiful people. He did not want Corsicans to become an extinct race. Accordingly, on 15 April 1769, Paoli convoked an extraordinary Consulta at San Antonio della Casabianca in the Casinca….Amid wild cheering resolutions were carried for "a leveé en masse"…every Corsican able-bodied from ages 6 to 60 were put at the disposition of Corsican freedom. "Since all Corsicans enjoy the same advantage of Liberty it is just that they all take part in its defense." Priests and Monks preached a holy war against their French invaders. Paoli knew that the French had, at the commencement of de Vaux’s attack, as many men as there were living, native inhabitants of Corsica. Perhaps Paoli, as a devout Catholic, hoped in his innermost heart for a miracle. If Corsica was defeated as a nation, its overthrow would be that of a nation, not of a guerrilla-band. He also believed in the ultimate victory of Justice over Evil. He was sure, that if Corsica would not be free within his own lifetime, in the fullness of time, eventually Corsica would be a free nation before God. In the presence of Lord Pembroke and Admiral Smith, Englishmen on unofficial business visiting the isle, reviewed his assembled troops.. In their company were two Italian painters who painted the General’s picture. In Paoli’s regiment were two companies of Swiss and Prussian volunteers, as well as a corps of Tuscan volunteers of which the Paoli brothers were extremely proud-of. de Vaux marched out of San Fiorenzo with 24 batallions and several squadrons of cavalry. They occupied the village of San Pietro di Tenda. Marbeuf had six infantry batallions and a regiment of Calvary. Grand-Maison in Oletta had a fourth batallion of Infantry. The French were everywhere! They had such masses of artillery in action; and all day long French cannons boomed.. On the 4th, de vaux#s troops moved against the village of Rapale. The fighting for the town was more than savage….Paoli’s two most trusted captains, Gaffori and Grimaldi, unknown to him, turned traitors! Initially it was Paoli’s express wish that the Golo was to be held at all costs. The bridge at Pontenuovo was protected by 15,000 troups under his Commandere Saliceti. he sent 1000 more men from Rostino. But Gaffori, the turn-coat, neglected to fortify Lento (believed intentionally), and this is where we get the widely used term of "a gaff"! There was hopeless confusion.. The Corsicans put-up a desperate resistence until nightfall. Their heroic struggle was in vain. the french had unlimited numbers of reinforcements. Pontenuovo was obviously the decisive battle. Treachery had caused the Corsican defeat. There were so many accounts of treason at this bridge! The despair this caused was increased was only increased as it became known that Cavavaggia was betrayed by Grimaldi! The defeat at Pontenuovo caused such a loss of heart that the people were unwilling to continue the struggle. de Vaux bribed the villages of the interior…but along with blandishments, also came intimidations so severe: Any Corsican found with an arm, with or without ammo would be sent directly to the gallows. 4000 French marched out of Calvi. de Vaux’s troops advanced from the South. The Corsicans were held-up at Isola Rossa; and as many of them as possible embarked on an English vessel and were taken to Ajaccio. Paoli shifted his headquarters to Vivario. Abbatucci held the French troops off until his people and command were successfully on a transport sailing out-of Ajaccio. Clemente informed his brother Pasquale that the "other side of the mountains" had no more troops to spare. The Corsicans caused the French disproportionate losses, but Paoli was now discouraged with the knowledge of such great miseries a continuance of guerrilla warfare would impose on the Corsican populace. From Vivario, Paoli gave the order to continue fighting only for long enough to enable the most deeply compromised of their leaders to "make their way to the other side of the mountains" or, if that be impossible, to some place on the east coast where they might embark for Tuscany. Paoli himself waited, entrenched in Vivario, until he was completely ensured that this had been accomplished. Then Paoli made his way to Porto-Vecchio, where on the 12 June, he was enabled to embark on an English vessel placed at his disposal by Admiral Smith. With him went 300 of his most faithful accomoraderie. About 300 others escaped intermittently to the Leghorn. The French had little affection for the Corsican monks who had supported Paoli. The French were all too aware that the Monasteries still kept the memory of Paoli hallowed. The Civil Commission was to appease those, who remained on the island and did not too radically deviate from Paoli’s system of government. But the islanders rejected the taxes. A shepherd said to the French collection officials, "Yes, we GAVE it to Paoli; but YOU TAKE IT FROM US!" The Corsicans viewed themselves as a defeated Nation, NOT as a conquered people.. Their clan system had been slighted, their chosen leaders were driven into exile, their liberty lost. They resented everything "French"! Out of sight of the island, merchant ship hoisted the Corsican National Flag, but this time with bandaged eyes. But then the French proceeded to re-organize the Paoli government into their French-government away from Corsicans.. The French began to enforce their ways all the more firmly. Suspected liberating sympathisers were quickly cut-down without trials, and stigmatised Corsican "bandits" were to hung from the nearest trees immediately, without any court proceedings. Families of those Corsicans who had gone into "Diaspora" were quickly deported. On 20 April 1771, and person helping or aiding a "bandit" or who had even written to a Corsican exile was to be immediately arrested and imprisoned. The "Podesta Majors" were commanded to squeal on any citizenry and provide lists of any suspected deviators. Fires could not be lit, or any other action that could be construed a signal. In August 1772, draconian measures were implanted. No Corsican could absent himself from the village without written French authorical permission. Everyone had to be enrolled upon a register. If not enrolled, he was proclaimed a fugitive.. If one did not return to his village before 6 months passed, he was declared a criminal and all his possessions were convascated. Four territorial juntas were set-up which had to cooperate with French troops. Mounted police were established in Bastia. Corsican politicians were to be "broken at the wheel". many houses were burned to the ground; no Corsicans would hold any office again. By 1774 pressures were mounting so high, that it exploded into a revolt. 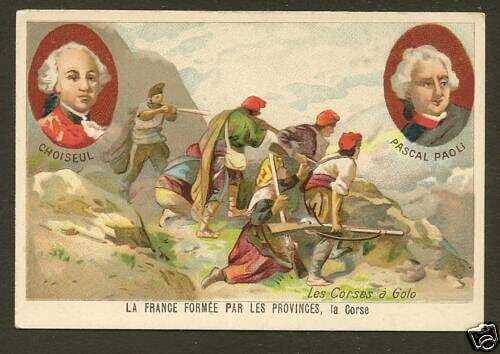 Corsicans were brought out in defense of Corsica, just at the mention of Paoli’s name…. Sionville overran the fortress of Bastia. He attempted NO JUSTICE. In every village, men between 8 and 60 were dragged out of their habitations and automatically hung. What was so hideous about Sionville’s vengeance over the Corsican people, remains in Corsican popular memory and song. Sionville repeatedly hanged any relatives of rebels he could find. No one was immune to his wrath. Not even those of second-degree cousinhood were safe from Sionville and his punishments. , To those that freely surrendered to him (at his word that he would place them in exile only) he DID NOT KEEP HIS WORD. He strangled some on the spot; others were sent to rot in dungeons on the continent at Toulon. His cynicism, brutality and arbitrariness sunk firmly into the Corsican conscience…. 20 years later, Corsicans were telling Pasquale Paoli of the horrors inflicted by the marching brigadiers. Narbonne-Fritzlare was hated as much as Sionville. He governed the island from August 1774 to May 1775. He was ruthless. His year of governance was smoky, bloody, full of trampling troops, blazing cabins…and he filled from the streets of Bastia cartloads of his prisoners…sending them on loathsome, overloaded ships to Toulon. Marbeuf returned then to rûle. He took within his quarters a mistress, Madame de Varese. he was full of injustices, vanity and pride. One of his most infamous of procedures was his condemnation of GIACOMO PIETRO ABBUTUCCI to the gallows (Paoli’s former side-Lieutenent in the "Olremonti"). Abbutucu had freely surrendered to the French. Why did Marbeuf hate Abbutucci so much? Abbutucci retained the respect and liking of even the most intransigent of Corsicans by his sweet disposition, moderation and good sense. His most damaging crime in the view of Marbeuf was that he authored a pamphlet complaining about Marbeuf’s mode of rûle!. In 1784, on the demise of Marbeuf, Vicomte de Barrin took over. Pasquale Paoli kept a close watch on Corsican Affairs. ²: Hundreds of eyes were said to scan the horizon off of the Corsican coasts for any boats bringing news from France; but no one was permitted to write to any relatives who might have sought refuge off of the Island. Tod do so meant to be executed immediately by the French without trial or notification to family members. This was "the great diaspora", where knowledge of families were lost for generations! There were an exceedingly large number of French troops on the island. The remaining population was agitated by French taxes Corsicans officials were constantly being replaced by foreign entrepreneurs and others placed into positions of authority by the French who knew or cared little for the Corsican people or their customs. France was determined to make Corsica into a model French State. Cherier, on 07 September professed that he would not permit Corsicans commerce. He would not allow money be passed"to the enemies of France"; he would hang them first before this would happen! This declaration was seen as a threat to all Corsicans remaining on the Island. When Cherier left his house, he was attacked. Pro-French families prudently took ship for Provence. Ajaccio soon followed the example of Bastia. At Corte and Sartene and Bonifacio similar occurrences prevailed. The villages of the interior were uncontrollable. There, the French government collapsed. In glen after glen, communities were personally electing commitees to take over French appointed officials. When news reached Paris, on what was disastrously happening to the French in Corsica, Saliceti and Cesari devised a plan. They were to set-up a "National Committee", composed of 22 members from the island. The Commitee would have an executive inspector in each of the 12 French-created jurisdictions. The Committee would be responsible to the decrees of the French National Assembly. even though this proposal would have given Corsicans a larger measure of autonomy, and many Paolists embraced it. Barrin rejected the whole plan, and ordered that French troops would be sent again to the island to restore french order. General Gaffori once united the Island…and his memory was still revered was sent to Ajaccio. Once he landed, he said that his sole ambition was to release Corsicans from servitude to liberty. The name he bored assure good-will and an assurance of Freedom. But the town was divided. Gaffori’s patriots hoped to pluck at least a degree of independence for their compatriots. Among them was Napoleon Bonaparte, a 20 year-old artillery lieutenant (who father was Paoli’s secretary). He had recently returned to Corsica, hopeful of employment. Paoli at first also believed that "The Constituent Assembly" would freely grant Corsica her liberty. His expectation was a disappointment. The Corsican cause WAS his cause. Paoli sent Masseria on two rejected the National Committee of Saliceti and Cesari as dangerous and impositions. There were many good intentions towards the General on the Island; but none expected the Corsicans to regain their freedom. In October, Paoli tried dialogue to break the status quo. He sent Antonio Gentili to Paris, where Gentili conversed with Lafayette and la Tour du Pin. Gentili explained that Paoli had given-up on the idea of an Independent Corsica in hope of creating a government in accordance to his Constitution implemented from 1755, along with the ancient character and Institutions and Traditions of the Isle. NOT TO BE BASED UPON THE SLAVISH FRENCH MODEL. Gentili recalled the happy days of Monsieur de Cursay where Corsican customs mingled with the happy Corsican rûle. He wanted to recreate a similar, happy state of affairs. La Tour du pin and Lafayette had firm doubts of ANY collaboration with General Paoli. The peace that Gaffori hoped to establish could NOT endure. The Manifesto of the Twelve rejected the proposals of Saliceti and Cesari. A manifesto, by the hand of Napoleon Bonaparte who led the Ajaciennes, was presented on 31 October. Meanwhile, Narbonne commanding 50,000 troups relieved Gaffori and reasserted a Tyranny on their Island. Ajaccio was seething. Bastia broke into open rebellion. the French saw Bastians as "beggars and Italians". Civil War loomed again…. In 1773 Corsica was rûed by France’s "Ministry of War". Financial matters were under the control of Abbé Terany. His agents were reckoned amongst the blackest of all the island’s oppressors. They were two Lorrainers: The Coster Brothers. They themselves remained in Versailles. they sent their representatives…hoards of their relatives and clients who fed greedily upon Corsican natural resources and the people.. To be part of the governing administration, it was said one must be a Lorrainer or related to a Lorrainer.. The reign of the Costers was truly deplorable.. Almost everything they used was imported from France (dress, food, drink, furniture, etc.). The French Inspector of Agriculture would not give permits to native Corsicans to farm. During the 20 years of French rûle, no benefits came came from agriculure and husbandry. They were not permitted to pasture their land, cultivate their fileds, etc. In 1789, when Paoli came back, he noted that Corsicans had neither ploughs, nor stables, nor dairies. Paoli who always treasured the choice Corsican Vineyards, was broken-up viewing the condition from neglect of the orchards of his land. French custom dues were unusually heavy. Fishermen were forbidden to fish by The French Royal African Company. Prior under Paoli’s administration, there numbered over 140 craft; and over 1000 men were employed in their coral-fishing industry alone! Paoli had an extensive road-system built, and he improved the roads throughout Corsica by 1768; now, they were in a state of ruin and people had to resort to using the old mountain passes and back alleys. Public works under the French, were executed by swarms of money-bagging entrepreneurs…acting like locusts. (They charged three times the amount any decent Corsican would ask for the same work performed.) The French also introduced a system of monopolies. The rights to sell, especially farmed-meats, skyrocketed. And since they were forbidden to hunt, they were forced to pay exuberant prices for meats and meat products. The monopolies also cornered the corn and chestnut industries. They held all the granaries. They forced those who lived in the Interior to repay the sellers on their borrowings from them into the next years harvests!. Everything was costly and uncertain. The judicial system which the French set-up obviously malfunctioned in vice of greed and special interest groups. The juntas overruled any court procedures and were oppressive. The Supreme Council was staffed by unqualified foreigners and lawyers with no legal-experience (only family ties to the rûlers on the Continent).